TAG Heuer, Google and Intel announce a collaboration to launch a Swiss smartwatch powered by Intel technology and Android Wear. Pictured left to right: Guy Sémon, General Manager of TAG Heuer; Jean-Claude Biver, President of the Watch Division LVMH Group and CEO of TAG Heuer, Michael Bell, Corporate Vice President and General Manager of Intel’s New Devices Group and David Singleton, Director of Engineering for Android Wear. 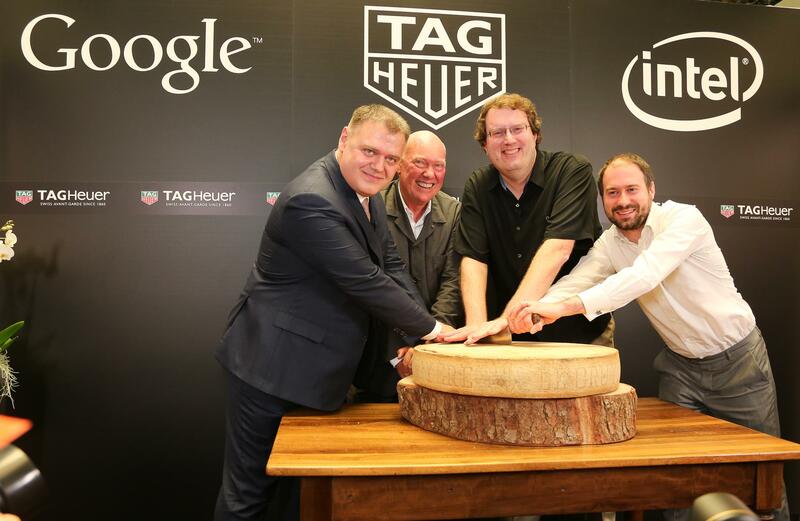 Baselworld, Switzerland, 19 March 2015 — TAG Heuer, Google and Intel have announced a partnership to launch a Swiss smartwatch powered by Intel® technology and Android Wear. The effort signifies a new era of collaboration between Swiss watchmakers and Silicon Valley, bringing together each company’s respective expertise in luxury watchmaking, software and hardware. The collaboration was made official at Baselworld, during a press conference held on Thursday 19th March at the TAG Heuer booth. Jean-Claude Biver, President of the Watch Division LVMH Group and CEO of TAG Heuer, David Singleton, Director of Engineering for Android Wear, and Michael Bell, Corporate Vice President and General Manager of Intel’s New Devices Group, joined each other on stage. Together, these companies will create a product that is both luxurious and seamlessly connected to its wearer’s daily life — a culmination of innovation, creativity and design from Silicon Valley in California and the Watch Valley in La Chaux-de-Fonds, Switzerland. “Swiss watchmaking and Silicon Valley is a marriage of technological innovation with watchmaking credibility. Our collaboration provides a rich host of synergies, forming a win-win partnership, and the potential for our three companies is enormous,”said Jean-Claude Biver. “As we work to enable technology experiences that provide greater utility and value to people, Intel is confident that a collective approach will inspire new innovation in wearable technology. The collaboration with TAG Heuer and Google brings us closer to realizing the vision of wearable technology with a distinctive smartwatch that elevates the category,” remarked Michael Bell.